Several non destructive evaluation (NDE) techniques were developed during the last two decades to detect and characterise corrosion and delamination in reinforced concrete bride decks. Among the available tools, the half-cell potential (HCP) test is the most used one for the evaluation of corrosion state. However, this test requires the closure of the bridges for several hours, which is particularly problematic in the urban zones. This explains the fact that the GPR technique, which is traditionally used for the detection of delamination, is preferred by the majority of bridge engineers. This technique is indeed fast, nondestructive, and can be used within an assessment programme of network level. Unfortunately, the GPR technique is not yet completely accepted by transportation engineers because its reliability is not satisfactory. The paper presented herein deals with a research project that was undertaken to determine the real ability of GPR technique to detect delamination in concrete bridge decks and to identify a manner of how bridge engineers can apply this technique in a useful manner. Several concrete bridge decks with asphalt coating were evaluated by GPR and half-cell potential tests. The results of these investigations were, in the majority of the cases, validated by visual inspection and chain drag sounding after the asphalt coating was removed. The first part of the study concerned the technical performances of the four main GPR systems used for bridge decks evaluation. It shows that, despite the progress made in recent years in the field of radar antennas, it is still impossible to detect delamination clearly and without ambiguity with the actual GPR systems. The research project also made it possible to study the various existing approaches of GPR data processing. Most of these approaches are subjective and do not lead to conclusive results. The alternative method of GPR data processing that was proposed and validated within this project relies on the determination of the variation of moisture and salts content in the concrete. In this case, the GPR results give information comparable with that given by the half-cell potential test. The quality of the GPR data. Data quality depends on the capacities of the GPR system used to highlight discontinuities (interfaces) in the medium, and on the adequate adjustment of the system set-up carried out by the operator. The reliability of a GPR survey is strongly dependent on the original quality of the data, and this whatever the type of post-processing carried out on of these data. Data processing and analysis. This activity involves using signal processing tools to extract the desired information from the collected data. The approach of data processing must first be identified on the basis of the following question : which is the parameter of the GPR data most sensitive to the information looked for and why ?. The reliability of the processing is thus a function of the approach adopted. Lastly, background of the operator with regard to the basic knowledge of electromagnetic waves,GPR systems characteristics, signal processing tools and field experience with this technique is significant because non-destructive testing is not only a science but also an art. Fig 1: Factors affecting GPR survey reliability. 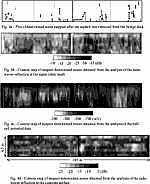 The research completed in 1998 by the GRAI related to the principal aspects affecting the reliability of a GPR survey and discussed above. Field investigations were performed on two asphalt-overlaid bridge decks (McDomald bridge and St-Régis Bridge) located in Montréal city with the collaboration of some research laboratories and industrial compagnies working in the field of NDE of civil engineering structures. In order to identify the GPR equipment that gives the best data quality and is most suited to the problem considered herein, a comparative study was carried out concerning the performance of four different GPR systems usually used for the evaluation of the condition of concrete bridge decks. For reasons of confidentiality, the identification of these systems is not given here. It is however possible to specify that two of these systems (systems A and B) were equipped with ground coupled antennas of operating frequencies equal to 1,5 GHz and 1,2 GHz respectively. The other two GPR systems (systems C and D) were equipped with horn antennas (antennas approximately 30 cm above ground) of 1 GHz frequency. The GPR surveys with these equipment were performed at low traffic speed (3 km/h), the same day and along the same survey lines (profiles). This is essential to establish founded conclusions with regard to this paramount aspect. The quality of the GPR data was evaluated according to the ability of the GPR systems to detect the different interfaces inside the decks (asphalt-concrete interface, concrete-upper rebar mesh interface, concrete-lower rebar mesh interface and bottom side of the deck). Typical signals collected in field with these various GPR systems are given in Fig. 2. Fig 2: Typical signals collected with the different GPR systems. The GPR system A was able to detect the asphalt-concrete interface on almost all the surveyed decks area (the thickness of the asphalt coating varied between 70 and 125 mm). The other systems detect this interface on approximately 60% of the surveyed decks. The upper rebar mesh were visible on all the GPR data. The system A allowed a good visualisation of these rebars. The visibility of the lower rebar mesh was better in the data collected with GPR systems with ground coupled antennas; the system A gives the best definition of them. The visibility of the bottom of the decks was generally not clear on the GPR data. In summary, the comparative study concerning the quality of GPR data collected with different GPR systems showed that the system A gives very interesting results. An example of data collected with this system is shown in Fig. 3. Fig 3: Typical data obtained with the GPR system A. In order to identify the data processing approach that leads to the most reliable results, a comparison of the various existing procedures was carried out. These procedures as well as the results of their application to the GPR data collected in field are discussed below. GPR signals reflections induced by delamination. Historically, this is the first approach used for the detection of damage in concrete bridge decks, however, its reliability was never obvious. The results of this study confirmed this fact since none of the radar systems used allowed the detection of delamination clearly and without ambiguity. This is certainly due to the dimension of delamination which is small with regard to the radar wavelengh in concrete (typically 10 cm at 1 GHz), to the proximity of delamination to rebars and to the prevalence of the reflections coming from the reinforcements. Attenuation of radar waves in concrete. Excessive attenuation of the radar waves in concrete is associated with high chloride concentration, and thus to areas of high probability of delamination. An example of the areas where radar waves are significantly attenuated is shown in Fig. 3. This approach is subjective and not allowed to achieve satisfactory results. This can be assigned to the fact that the variation of the radar wave energy in concrete is not only a function of the physical state of this material but also depends on the energy transmitted via the asphalt surface and via the asphalt-concrete interface. Attenuation of radar waves reflections at the upper rebar mesh. Fig. 4b shows the spatial distribution of the reflected electromagnetic energy (in dB) at the upper rebar mesh for the McDonald Bridge. According to this approach, the higher attenuation values (values lower than 28 dB) are associated with the presence of damage. In Fig. 4a, areas where delamination was detected by manual sounding are also indicated. It can be seen that the two results are not really in agreement. Determination of the dielectric constant of the concrete. This procedure is the most interesting one because it does not consider the detection of the delamination but rather it relies on the detection of the causes that give rise to these mechanical discontinuities, i.e. the excessive presence of moisture and salt in concrete. This procedure is applicable to GPR data collected with horn antennas since it requires measurement of the reflection amplitudes at the asphaltconcrete interface as well as the reflection amplitudes at the asphalt surface.Unfortunately, due to the data quality used to study this approach (GPR system C), the results obtained were not as good as anticipated. Fig 4: Comparison of the result of manual sounding, GPR data and half-cell potential data of the McDonald bridge deck. The synthesis of the results obtained in this part of the research shows that most available GPR data processing approaches do not gives conclusive results. A new data processing approach was then proposed and validated. This approach also relies on the ability of the GPR technique to detect the causes of corrosion initiation and development. However, this approach is simple, fast and does not requires measurement of several GPR data parameters, which limit the uncertainty of the results. It consist on the measurement of the intensity of the waves reflection at the top concrete surface. The scale of this attenuation (in dB) has been designed as the Radar Corrosion Index (RCI). The lower values of the RCI correspond to low corrosion probability whereas the high RCI values correspond to high corrosion probability. The results of the GPR data processing were compared to those obtained with the half cell potential test since both of these techniques are sensitive to the electrical resistivity of concrete. Fig. 4c and Fig. 4d give the contour plots of the RCI data and the half-cell potential data respectively in the case of the McDonald bridge. It can be seen that most areas of high probability of corrosion indicated by the half-cell potential test (potential < -350 mV) are also indicated by the GPR survey as corroded areas (RCI > -15 dB). Fig. 5 gives the average variations of the half-cell potential values as well as the radar RCI values in the case of the St-Regis bridge deck . The analysis of these results shows clearly that when the half-cell potential values decrease (increase of the probability of corrosion), the RCI values increase and inversely. Thus, it appears possible to characterise the corrosion activity in concrete bridge decks from the analysis of the GPR data. Fig 5: Comparison of the average variation of the half-cell potential data and and the RCI data for the St-Régis bridge deck. To confirm the validity of these results and to determine the correlation between the RCI scale and the half-cell potential scale, further GPR and half-cell potential tests were carried out on six concrete bridge decks. Electrical resistivity tests were also carried out on these bridge decks to better understand the relation between GPR and half-cell potential surveys. The analysis of these results is still under study. The work completed within this two years project was useful on several aspects. The comparative study concerning the performance of the existing GPR systems was really important. It made it possible to note that the technology of the radar antennas made significant progress in recent years. However, taking into account the low dimension of delamination, the proximity of the delamination to the reinforcement, and the insufficient resolution of the radar antennas, it is still impossible to detect delamination clearly and without ambiguity. The research project also made it possible to study the various existing approaches of GPR data processing. Most of these approaches are subjective and do not lead to conclusive results.Another reason behind this lies in the fact that the GPR survey results are always correlated with the result of manual sounding. This can be carried out only when the relation between the physical properties of the concrete and the damage in concrete is well established, which is not yet the case. The alternative method of GPR data processing that was proposed and validated within this project relies on the determination of the variation of moisture and salts content in the concrete. In this case, the GPR results give information very comparable with that given by the half-cell potential test. The authors gratefully acknowledge the financial support of the NSERC, the Minister of Transportation of Québec as well as Geophysical Survey Systems Inc., Dalhousie University (Nova-Scotia), Corrpro Canada and Geophysique GPR International Inc. for their participation to this study. Pullar-Streckerm, P. "Corrosion Damaged Concrete: Assessement an Repair," Construction and Industry Research and Information Association, London, Englang, 1987. Nazarina, S."Detection of Deterioration Within and Beneath Concrete Pavements with Sonic and Ultrasonic Surface Waves," Proc. of Nondestructive Evaluation of Civil Structures and Materials. Boulder (CO): NFS and University of Colorado, October 1990. Chung, T., Carter, C. R., Manning, D. G., Holt, F. B. 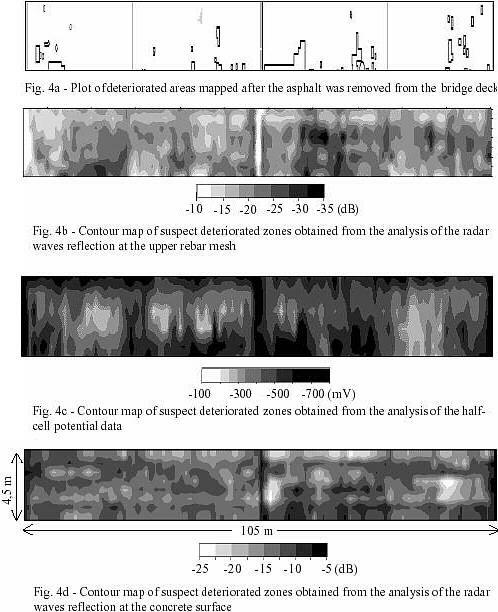 "Signature Analysis of Radar Waveform Taken on Asphalt-Covered Bridge decks," ME-84-01, Ontario Ministry of Transp. and Communications, Res. and Dev. Branch, Ontario, Canada, 1984. Manning, D. G., Holt, F. B. "Detecting Delamination in Concrete Bridge Deck," Concrete International, Vol. 2, No 11, 1980, pp 34-41. Rhazi, J., Tarrusov, A., Ballivy, G. "Comparative Study of NDT techniques applied to concrete bridge decks," Report No GR-99-01-01, Depart. of Civil Engineering, Université de Sherbrooke, 1999 (in French).